The HudsonAlpha Institute for Biotechnology has a four-fold mission of conducting genomics-based research to improve human health and well being; implementing genomic medicine, sparking economic development; and providing educational outreach to nurture the next generation of biotech researchers and entrepreneurs, as well as to create a biotech literate public. 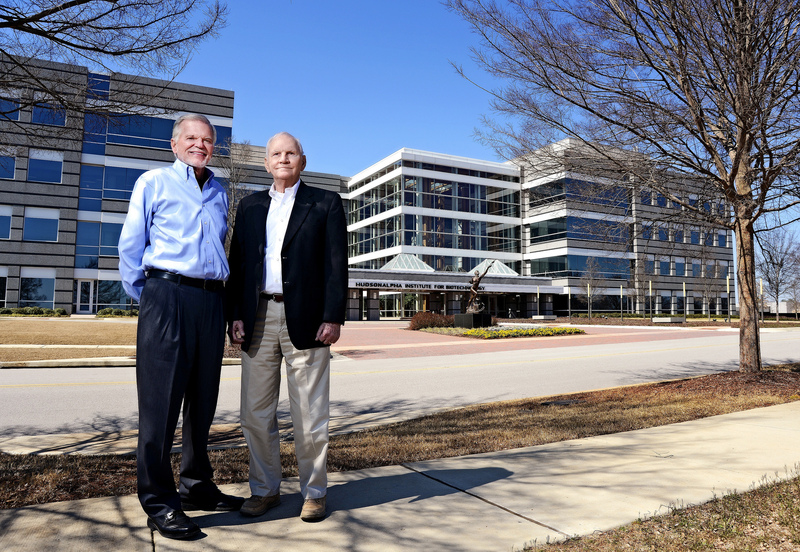 HudsonAlpha is the brainchild of founders James R. Hudson, Jr. and Lonnie S. McMillian. Each is a serial entrepreneur whose career path led him to understand the promise of genomics and who possessed the drive to translate this promise into measurable, real world results. The announcement of the creation of the nonprofit Institute came in 2005, and the doors opened in 2008. Lonnie McMillian’s incredible generosity, along with the State of Alabama, provided the funding needed to make the HudsonAlpha Institute for Biotechnology a reality. Drawing on their experience and envisioning a course for the future, Hudson and McMillian recognized that four ingredients are essential for improving human health and well-being: education, research-driven discovery, clinical care, and entrepreneurship. HudsonAlpha unites these four endeavors into a single enterprise. Since the Institute’s 2008 opening, HudsonAlpha has generated major discoveries that impact disease diagnosis and treatment, created intellectual property, created a clinical genomic medicine program, fostered biotechnology companies, and expanded the number of biosciences-literate people, many of whom will be the future workforce. Equal parts scientist and businessman, Jim Hudson’s investments have shaped the advancement of biotechnology around the world—but especially in the state of Alabama. Hudson founded and served as chief executive of Research Genetics, Inc., which in the 1990s became the world’s leader in genetic linkage products and an integral partner in the Human Genome Project, the international effort coordinated by the U.S. Department of Energy and the National Institutes of Health to identify the sequence of the DNA found inside human cells. Following Research Genetics’ 1999 merger with Invitrogen Corp. (now Life Technologies, Inc.), Hudson remained committed to local entrepreneurs, serving as a mentor and advisor to companies in industries ranging from genetics research to Internet services. Lonnie McMillian—the “Alpha” in HudsonAlpha—is an engineer by training. Early in his career McMillian cofounded a company that built mini computers and he helped it grow into a successful venture that employed hundreds of people. The company’s 1981 sale kicked off a series of successful business ventures that culminated in 1986 with McMillian co-founded ADTRAN, today a leading global provider of networking and communications equipment. By the 1990s he had turned his attention to biotechnology and, following his 2001 retirement from ADTRAN, he immersed himself in the life sciences. Along the way he sought out Jim Hudson, then at Research Genetics, and the idea of a nonprofit institute for biotechnology began to percolate. Like Hudson, McMillian has mentored countless aspiring entrepreneurs and, as a philanthropist, his nonprofit Alpha Foundation has honored a long-standing commitment to Huntsville’s economic development and growth. Jim Hudson, founder and chief executive of Research Genetics, Inc. in Huntsville, Alabama, steps down from his company post when Research Genetics merges with Invitrogen Corp. Prior to the merger, Research Genetics had become the world’s leader in genetic linkage products and an integral partner in the Human Genome Project coordinated by the U.S. Department of Energy and the National Institutes of Health. With stewardship anchored by the Alabama-based Alpha Foundation, Hudson and other principals plan in earnest to create a not-for-profit, 501(c)3 organization that will utilize high-throughput genomic technologies to cultivate advances in personalized medicine. Anonymous, private donations totaling $80 million pledged. Groundbreaking ceremony for HudsonAlpha; also formally established the CRP Biotech Campus. Dr. Rick Myers, professor and chair of genetics at the Stanford University School of Medicine and director of the Stanford Human Genome Center named director of HudsonAlpha. Ribbon-cutting for HudsonAlpha Associates Wing and announcement of 12 resident companies. With 12 companies, lease space is filled and expansion plans are under development..
September of 2008 Biotech 101 public education seminar series debuts. BioTrain Internship program launches in summer of 2009. Genome Sequencing Center (GSC) sequences soybean, an important agricultural crop worldwide. HudsonAlpha Foundation established to financially support the work of the Institute. A genomic medicine team is recruited to launch the Institute’s fourth mission, to leverage the power of genomics in a clinical setting and establish a clinic for genomic medicine. Smith Family Clinic for Genomic Medicine and the HudsonAlpha Clinical Services Lab open to provide clinical care to patients. New genes associated with ALS discovered. Information is Power program starts offering free genetic testing for cancer risk to people in North Alabama. Clinical Sequencing Evidence-Generating Research (CSER) program provides 100th child with a genetic diagnosis. New genes associated with triple negative breast cancer discovered. HudsonAlpha's economic impact exceeds $1.85B. HudsonAlpha celebrates a Decade of Discovery, the ten-year anniversary of opening the doors of the Institute. HudsonAlpha’s campus boasts 14 faculty members with more than 650 published papers, The campus includes 35 associate companies. The Educational Outreach team at HudsonAlpha has impacted more than five and a half million individuals from 2008-2018. The HudsonAlpha campus expands, opening the Paul Propst Center at 800 Hudson Way.